You’re One Lucky Dog, Bogart !! Wow!! When I received this photo of Bogart, I nearly flipped. He has a way of charming people to dote upon him, big time! 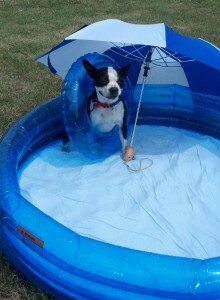 Last summer he had his own inflatable pool. This year a few more amenities have been added to his pampered lifestyle. An umbrella and a float ring are over the top!! Surely, in September when he rejoins the Kindness Bus Tour, he will be in for a culture shock of epic proportions. Having a big support group of people who love him is part of the reason he is friendly to everyone. Every dog should lead the life Bogart lives. This entry was posted on Sunday, June 17th, 2012 at 6:35 am	and is filed under Kindness. You can follow any responses to this entry through the RSS 2.0 feed. You can leave a response, or trackback from your own site.